The Dragon Boat Cebu Central will hold the first Cebu Dragon Boat Fiesta at the Cebu Yacht Club on April 28-30 in a bid to establish Cebu as the Dragon boat hub in the Philippines. The three-day event, supported by the Cebu Province Sports Commission and the Philippine Sports Commission, will have teams from 40 countries as well as local teams. "We hope the Cebuano community will support this event. Cebu has a great chance of becoming a dragonboat hub because we have the perfect seas, hotels and an international airport," said Charlie Holganza, the father of dragon boat racing in Cebu. Holganza, whose group has been conducting seminars for newbies all over the province, said the event is their first step in their dream of hosting the dragon boat world championships in 2019. "There are 33 teams that have already shown their intention to join. These are foreign club crews and local teams. We still have a lot of teams who are inquiring so we expect to get 40 teams," said Nonnie Lopez, one of the event organizers and the coach of Gruppo Habagat team. The event will be held days after an annual dragon boat race in Boracay, and Gruppo Habagat expects participants in the Boracay race to also join their event. "They will pass by Cebu both before flying in and flying out of Boracay, so they might as well join our event, so they can join two events instead of one," said Lopez. 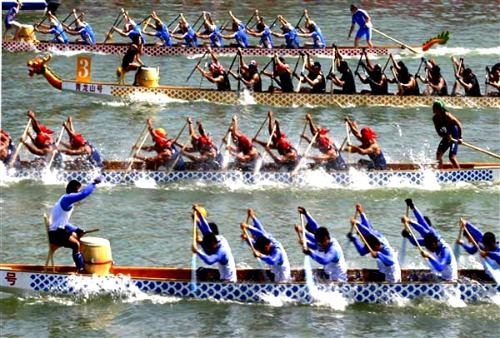 The Cebu Dragon Boat Fiesta is a competition of club teams from various country, while their ultimate target--the World Dragon Boat Championships--is a competition of national teams from various countries. Among those expected to participate for the April event are teams from the US, Guam, Hong Kong, Italy, South Korea, Singapore, Brunei and Malaysia. A team from the Philippine Accessible Disabiity Services, headed by JP Maunes, will also join. It is the first cross-disability team from the Philippines which will be competing in an international event later this year. Lopez said that with each crew having some 12 to 25 members, depending on the event it is joining, they expect around 1,000 individuals for the event, which could also boost local tourism. The race categories are the all-women's, all men's, mixed crew and masters, while the distances are the 500-meter and 250-meter divisions. "We started giving our support to this in 2015 because economy-wise, it will attract more tourists and there is also the potential of discovering talents," said Atty. Ramil Abing, the executive director of the Cebu Province Sports Commission. Randy Su, one of the organizers, also hope to tap the support of colleges, especially those that offer maritime courses, and hope the local schools will form their own teams. "There is a deep pool of talent in Cebu waiting to be tapped," said Lopez, adding that Bohol already has an inter-school dragonboat competition. Meanwhile, the organizers hope to attract a sizeable crowd by holding a friendly competition a day before the event that will start at the old Mandaue-Mactan bridge and end in the new bridge.